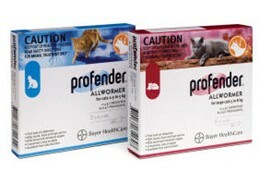 We are now selling Profender for cats. Profender is the only complete spot-on worming treatment for cats. It treats cats for roundworms, hookworms, tapeworms and lungworms. If your cat hates taking tablets, Profender is the perfect solution! Buy Profender for Cats HERE!